Collaborate For Quality: Would your business be more efficient if staff could work as one, wherever they are? Implementing SharePoint or Office 365, or both, across your organisation enables every team and every staff member, however remote, to work as effectively as if they were in the office. Securely and reliably sharing data and applications across every device, with full mobile access, even far-flung individuals can collaborate instantly as part of the team. Effective collaboration enables ideas to flow naturally, faster, easier decision-making and and helps businesses to move forward and scale with coordination, spark and vibrancy – with the whole team behind them. Collaborating with clients and suppliers as if they were part of your team will help you to scale your business; improve efficiency; reduce your risks; and add customer value. Contact us if you would like to discuss this further or call 01634 505100 to arrange a free assessment. After working with EcoBytes, a Marketing agency scaled their business using Microsoft SharePoint to collaborate with clients and suppliers. Now, both clients and collaboration partners log into a branded SharePoint portal to view project information including task timelines, key contacts and announcements. Secure libraries with automated workflows track approvals and publish the current approved version of documents based on user permissions. The main benefit of the system has been a significant reduction in emails and attachments. Communication has also improved as clients can view real-time project reports. Travel time and costs has also been reduced with Skype for Business online meetings. In addition to providing quality control and consistency, the system also freed up valuable time for the owner to spend developing their business. The company is now working with EcoBytes to implement Dynamics 365 for Sales and Project Service automation to further scale their business. 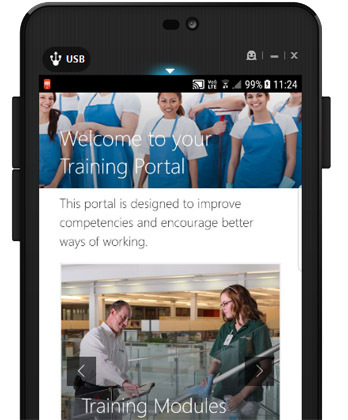 A Commercial Cleaning company systemised their training processes by replacing paper-based training modules with the EcoBytes Training Resource Portal. Increase Customer Satisfaction by ensuring everyone consistently operates to your quality standards.